A Messy Kitchen: Ensaïmadas - let's visit Spain! Ensaïmadas - let's visit Spain! 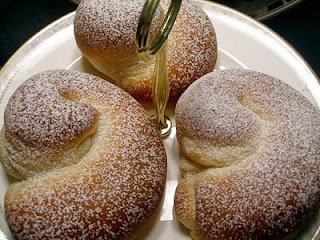 "A Majorcan favorite, ensaïmadas are warm, yeast-based cakes fashioned into round, coiled shapes." This is the baking challenge for this month. Since my brother and sister-in-law just visited spain over New Year's this will be like a nice little return trip. The question will be whether to make the one big spiral that can be cut and served to many, or the individual little "snails" that are more portable and hand friendly. I think the little ones will be more conducive to sending to work with the hubby. 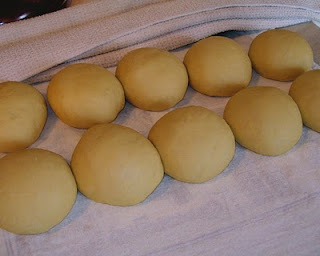 Even though it can be more difficult to work with, I must admit that I love soft or slack bread dough. So far, my all time favorite is the Overnight Ciabatta at Wild Yeast. 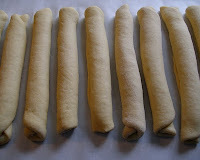 That dough is like handling silk; as long as you have enough flour dusted over it. Sooner or later, I will hit up the butcher for some leaf lard and render it down to have on hand, but for now I will be using butter in place of the traditional lard. I do love butter... Evidently, the test for telling if the ensaïmada in question has used lard or not is that a true ensaïmada must stain a piece of paper with the pork lard. 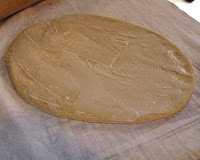 I know some bakers who swear by lard in their pie crusts for the flakiest results. And it has its highest proportion of fat as monounsaturated fat, so not bad for you. Interesting factoid: the increasing incidence of coronary heart disease in America over the last century can be directly correlated to the abandonment of good natural animal fats like butter and lard in favor of processed, hydrogenated, bleached shortenings and refined vegetable oils. Another good thing about lard the that it has a high smoke point, good for frying. I understand you actually end up with less grease absorption when frying in lard. So I guess Emeril was right all along! More pork fat! Seriously, when I added more fat back into my diet (along with removing most refined carbs and limiting sugar intake), my triglycerides dropped 56 points to a completely normal reading. Not to mention the 42 pounds I lost. Woot! And I think I at least doubled my fat intake. Animal fat. Good stuff. Sorry, I'll get off my soapbox now and attend to the snails at hand. ☺ Wow, that is some happy dough! 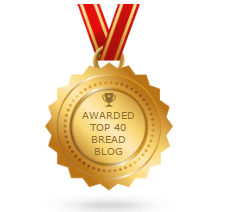 Here is the original recipe and challenge, found at Bake My Day! Add the flour together with sugar and salt into a large bowl and mix well. 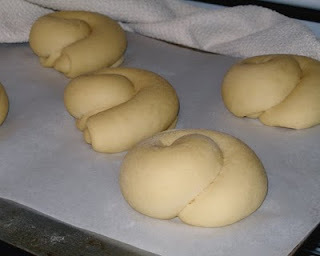 Make a hollow in the center, add the crumbled yeast as well as a decent pinch of sugar and pour over just enough of the lukewarm milk until the yeast is covered. Stir the yeast milk once or twice, then cover the bowl with a kitchen towel and let rest for about 15 minutes or until the surface of the yeast milk looks bubbly. Add the other ingredients (the remaining milk, eggs, oil ) and knead well, either by hand or with your kitchen machine until the dough comes together nicely. Add additional flour as needed to make a soft but cohesive dough. Rest in a covered bowl again in a warm place for at least 30 minutes or until the dough has doubled. Punch it down softly, then flip the dough onto a well-floured surface and sprinkle with flour. Cut into about 10 equally sized portions and form into neat little balls. Sprinkle with flour and let rest, covered with a kitchen towel, once more for at least 30 minutes. Preheat the oven to 200°C (~390° Fahrenheit) and bake for 14 to 16 minutes or until golden brown. Take out and let them cool down on a wire rack for a couple of minutes, then generously dust with powdered sugar (leave the bacon grease ones plain) and enjoy while still warm. Greasy fingers included! Thanks for the challenge girls. Yummy! You know, these turned out well enough that I think I will submit them to yeastspotting. They are adorable! So soft and fluffy, that last one is definitely calling my name! Thanks for baking with us. Holey Moley! You know how to bake 'em woman! 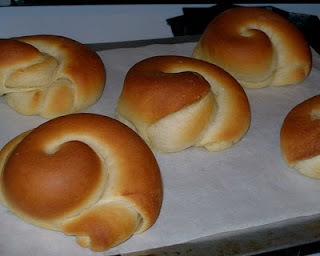 Beautiful buns! 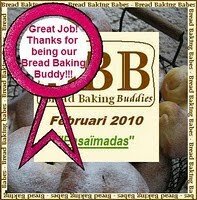 Thanks for baking with us!! Hope to see you next month! Those look delightful. Nice fat lesson. Lovely. Thank you for sending these beauties to YeastSpotting! Interesting about the fat...and so true that hydrogenated fats and oils are terrible for our bodies. These are beautiful 'snails' and I love what you did in the final photo with the filling and powdered sugar...truly a fine dessert! 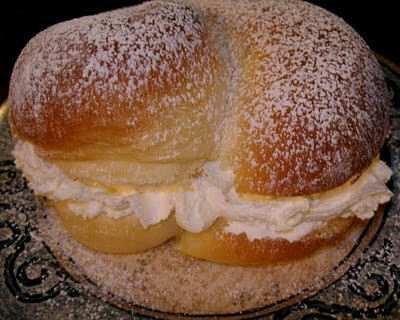 o yes, hip hip for the cream-filled one! That's hardly bread anymore, we'd better start calling it pastry... love it! Wonderful! They look just perfect. Love that last one - I tried to pluck it from the screen and gobble it up. I am with you on the animal fat vs. "better living through chemistry"
As I stand here preparing some homemade burger buns right now, it occurs to me that these leftover buns could stand in for burger buns in a pinch. They would make a fabulous Monte Cristo... I'd even consider making the recipe again for burger buns although I'd cut back on the sugar for that. Wow those are gorgeous! I love that you made them into a cream puff. So yummy! Thanks for the info about lard and animal fat. I heard this recently as well and was very surprised by it. But the data (and your results) speaks for itself. They look so delicious. I love the shape- very pretty. Coconut, toasted nuts, chocolate. Mmmmmmmm.